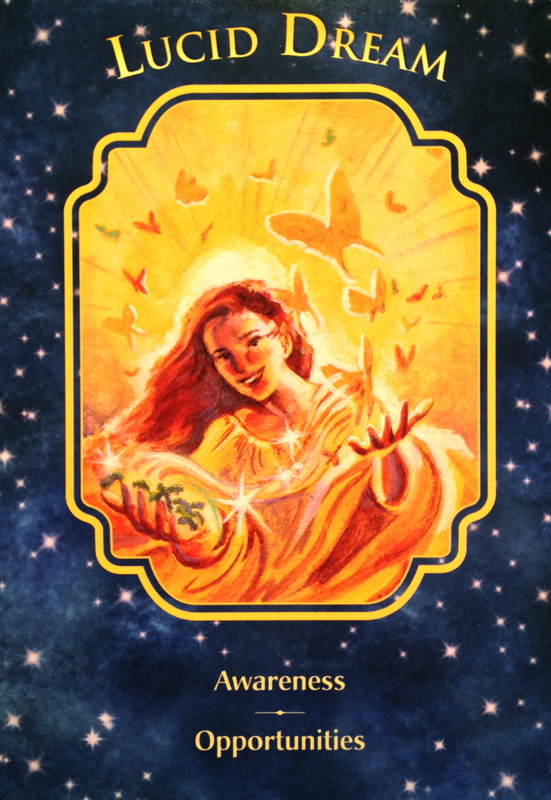 “The Lucid Dream card has come to you to bring awareness of new opportunities. Wake up to any that are around you. You have the ability to change your personal reality. In every situation there are at least two choices. Stay present so you may be aware of them. Trust yourself, your intuition, and your abilities. Remember: at any moment, you can make a choice to change your situation. You are a co-creator. During a lucid dream, you are aware of the fact that you are asleep. This recognition allows you to change situations and your surroundings in your dream state. Basically, you can create anything that you choose! Lucid dreaming helps you to actualize your dreams in waking reality. We have a clear message here to watch for new opportunity, using all of our senses. This is a good time to tune in to our higher senses, both to hone and develop them and also to learn to trust them. We often look past our own intuition to outside sources to tell us what avenue to choose, what relationship to pursue, or what decision to make. This is of the past, and wrapped up in our old belief systems that led us to believe that others knew more about what we should do with our lives than we did. Looking outside for others to guide us is no longer an option and we must trust ourselves, our hearts and our own internal guidance to find our way. When we trust in ourselves and make our own choices, we give up the victim mentality and see ourselves as powerful creators. We take responsibility for what is being created around us, knowing that what we project today, in this moment, will manifest itself in our future… good or bad! When we stop asking for constant advice, and look within, listening to the guidance from our higher selves, or Spirit, then we can fully step into our power. Pay close attention to your dreams at this time, using them as a tool to communicate with your Soul. Set an intention or ask for a clear answer to a question. Ask for guidance from your angels or for a spirit animal messenger to visit you with a sign just for you. Use a dream journal to track any patterns or synchronicity as you work in this realm. Know that everything you need is within you.